In WordPress, navigate to Plugins > Add New. Search for “Digital Publication by Supsystic” and click install. When the installation has completed click “Activate Plugin”. You will have a new admin menu item titled “Digital Publication by Supsystic”. In your personal account on the supsystic.com, you will find a unique download link after purchase. After downloading the file digital-publications-supsystic-pro.zip, navigate to Plugins > Add New > Upload and upload the file. When the installation has completed, click “Activate Plugin”. After activation the PRO version, you need to enter a license key (you can find it in your personal account on our site). Creating your first publication is really easy with Digital Publication plugin. Just install it, activate and use. 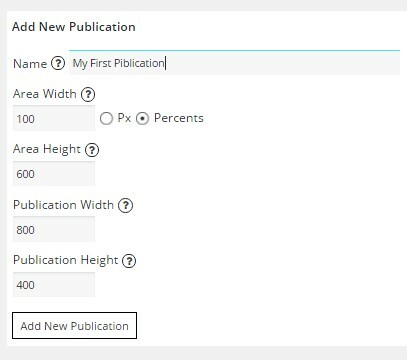 Choose the name for publication, define its size and click button “Add New Publication”. Open your publication and you will see several tabs: Properties; Pages; Add page; Add from WP Gallery; Add From FTP; Add From PDF; Facebook Import. Read more about this tabs – go links. After you’ve added your pages it’s time to set them. Go to Pages tab and here are all your created pages. When this part is ready – it’s time to set your online publications and make them look good. Go to the Properties tab. Name – change the name of publication if you need it. Set the size of your publication and area of publication. For example, a size of your publication is 600*400. So set it for Publication Width and Publication Height. And for Area Height and Area Width set just a little bit bigger size – 700*500. It helps your publication to look completely and won’t cut it. Choose Cover Type and Flip Sound. You can disable sound, Set default or maybe you are very demanding and have own sound for flip – feel free to upload and use it. Cover type helps you to make publication looks like a magazine – it’s how your page will be covered – soft or hard. And of course, Transition Direction Left to Right or conversely. Transition Duration – choose speed for your publication. Choose how your customers will see your publication – Open Publication On Page. Select Content Indent – put 0 or nothing if you don’t want any intent of your pages. Bigger number for bigger indent. Zoom Level – choose a level of zoom, that will be set after you click on Zoom button. Features that help making your publication like a paper magazine: enable Show Gradients – make shadow in center of publication like shadow between pages in paper magazine; Volume Fake Pages – like you look at real magazine with pages, Border Shadow – pages will cast a shadow on the area. To read all information about Digital Publication Properties check this article. Click Preview to see how does your publication look and don’t forget to Save your setting. Copy the shortcode of publication and put it on your page or post, and enjoy Digital publishing solutions of Supsystic plugin.